Anthony T. Rossi was born in Messina, Sicily, on September 13, 1900 to a family of nine children. He came to the United States when he was 21 with the intent of raising money for a film-making trip to Africa. While living in New York City, Rossi eventually abandoned this idea and went to work. Some of his first jobs include: machinist’s assistant, driving a cab, and running a grocery store. By 1941 Rossi moved to Florida with the intent of becoming a tomato farmer. When this venture was not successful, Rossi moved to Bradenton to open a cafeteria. His venture prospered and he eventually owned restaurants in Miami and Bradenton, but rationing caused by World War II crippled his restaurants, causing Rossi to seek other opportunities. During this time, Rossi became involved with the Florida citrus industry. Soon after the closing of his restaurants, Rossi began selling gift fruit to famous New York department stores like Macy’s. By 1947 Rossi owned a packinghouse in Palmetto and distributed fresh orange juice to local customers. His success led him to create Fruit Industries Inc. Demand for Rossi’s fresh orange juice grew, and Rossi was soon supplying the famed Waldorf-Astoria in New York with 1,000 gallons of sliced citrus per week. In order to keep citrus fresh during shipping, Rossi developed the first refrigerated trucks for his products. The success of Fruit Industries Inc. led Rossi to become involved in every aspect of orange juice production, including processing, transportation, packing and distribution. The name of Fruit Industries Inc. was changed to Tropicana in 1957. Rossi developed a major breakthrough in citrus processing when he created a pasteurization process that would allow fresh orange juice to be bottled and stored without concentration or refrigeration. This development now made it possible to provide orange juice to the public in forms other than frozen concentrate. As the popularity of Tropicana products grew, Rossi bought a ship, the S.S. Tropicana which was used to ship millions of gallons of fresh orange juice to New York, starting in 1957. On December 1, 1959, Rossi married his second wife, Sanna Barlow Morrison. Four years later, the Florida citrus industry suffered a severe freeze, sending production plunging. Rossi turned to Mexico for a new supply of oranges, but found quarantines prevented him from brining the oranges to process in the U.S. Rossi got around this quarantine by building what was essentially a floating processing plant that could be towed to Mexico and bring back orange juice to the U.S.
As the years progressed, Tropicana only continued to grow, causing Rossi to develop the Tropicana Juice Train in 1970. This mile long train carried one million gallons of orange juice to New Jersey on a weekly basis. This increased demand for Tropicana products, causing the Juice Train to run more frequently. As Rossi’s products became famous across the country, he lobbied to provide fresh orange juice to school lunch programs. Rossi’s immense success in the fresh orange juice market earned him the title: “The Father of Chilled Juice in Florida.” In 1978, Rossi retired and sold Tropicana for nearly $500 million. Rossi used this money to begin several charitable Christian ventures including: Bradenton Missionary Village, a home for retired missionaries, and Aurora Ministries, an organization that created and mailed audio tapes of scripture in native languages of dozens of countries world wide. 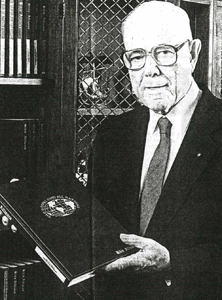 Rossi was honored with induction into the Florida Agricultural Hall of Fame in 1987. In recognition of his many years of service to the Florida citrus industry, Rossi was inducted into the Florida Citrus Hall of Fame in 1977. Anthony T. Rossi died on January 24, 1993. His wife, Sanna, wrote a biography entitled Anthony T. Rossi, Christian and Entrepreneur: The Story of the Founder of Tropicana.